The word Noor, for many people, brings to mind black or dark, especially coupled with the black motif inside the new jewelry store that bears the name. Maybe youâ€™re thinking the word â€œnoir?â€? Noor actually means light in Farsi (Persian), and is symbolic of friendship and the business union of owners Alexander Raissipour, a Persian American, and Adrian Bray, a British-born SLO transplant. The Noor specifically refers to a pair of infamous diamonds, the Dar-i-noor and the Koh-i-noor that are now part of the Persian and British crown jewels, respectively. OPEN FOR BUSSINESS : Alex Raissipour (right) and Adrien Bray (left) opened Noor, a jewelry store that specializes in one-of-a-kind pieces. # â€œWeâ€™ve been friends for quite a while and decided it would be good to go into business and work together,â€? Raissipour explained. You may recognize Raissipourâ€™s faceâ€”it used to be the one smiling from behind the counter of Blazing Blenders. Bray, too, isnâ€™t a newcomer to the SLO business scene. For more than 16 years, heâ€™s operated in the financial-management field, and both men are involved with local Rotary. â€œWe looked around, and this was perfect,â€? said Raissipour, who still owns the original smoothie shop. He was referring to the old Blazing Blenders storefront where Noor is now housed. Although Raissipour hasnâ€™t yet announced the new location for Blazing Blenders, he said that it will find a new and permanent home downtown. The old smoothie counters cluttered with straws and stacked lids have been replaced with glass cases and shelves filled with treasures. The overall space is on the small side, but Raissipour insisted that itâ€™s just the right size to give customers a positive experience. â€œOne of the ideas in the design is that it puts the pieces very close to the customer,â€? he said. â€œYou can see the piecesâ€”like in a museum.â€? Indeed, very little space is wasted, so the room actually holds much more than you would expect. There are quite a few original pieces in the showroom, including a collection of beautifully handcrafted stars of David, many of them fashioned by local artist Ron Wilson. The stars are uniqueâ€”and apparently not easy to find in our area. â€œWe have been told, by many of our Jewish customers, that they could not find Jewish religious pieces,â€? Raissipour said with some amazement. Noor also carries other work by Wilson: large, earthy stones; twisted metal; and glass pieces. 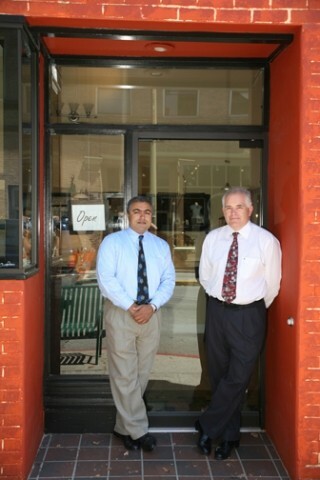 Noor also boasts a jeweler with more than 40 yearsâ€™ experience. Raissipour noted a corner thatâ€™s now filled with chairsâ€”the future location of the shopâ€™s bridal department, where customers can look at the intricacies of the stones and find encouragement toward involvement at all levels of the jewelry-making process. Raissipour acknowledged that SLO already has several jewelry storesâ€”especially in the downtown area-â€”but is positive that shoppers will find something new in his store. â€œWe have a growing and highly affluent community,â€? he explained. He said that he sees the opportunity for SLO to become a jewelry-minded town and that it could be thought of as a destination for high-end jewelry and as a community that values art. Friday, July 7, marks eight weeks of business, which have surpassed expectations for Noorâ€™s owners. To celebrate, Noor is hosting a reception with wine and cheese at SLOâ€™s monthly Art After Dark, to promote local artists and the business as more than a place to buy a ring. Noor also plans to participate with different artists as a gallery for Art After Dark. The grand opening starts Friday and will continue every Friday between 5 and 8 p.m. at 1108 Broad St. For more info call: 546-8000.